Looking for a way to customize your poker table cloth? If so, the state of the art method is to custom dye sublimate your cloth. The process is twofold. First you need to create a fantastic design. It is best to use vector based software, like Adobe Illustrator. If you don’t have access to that software or are not proficient using that program, the design team at Straight Poker Supplies can help. They can create a template for you outlining the size of the table and also the size of the print area which will show once the poker table is upholstered. How much to print a logo on cloth fabric that you sell? Are you able to print a logo on the Green Foam covers? If yes ..what is the cost? 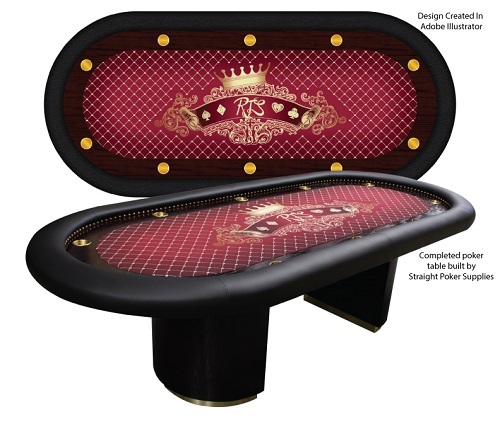 What would it cost to make a custom felt table cover....same size as a blackjack table. Hi looking for Oilers logo on Oilers colours felt for a poker table. Would you have something like that? What would be the approximate cost?